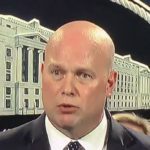 Yesterday, illegitimate Acting Attorney General Matthew Whitaker stepped up to the podium under the lights, and promptly melted – literally. Buckets of sweat came off the guy’s head as he nervously fumbled his way through a press conference that was supposed to be about a Chinese tech company. Then we found out why. Matt Whitaker was inevitably asked about the Robert Mueller investigation. He responded by half-coherently claiming that Mueller’s investigation is all but done, and that he’s expecting Mueller’s report very soon. Uh, wait a minute. We think that, after Roger Stone’s arrest, Donald Trump told Whitaker to go out there and say this as a way of feeding Trump’s delusions that Mueller is about to exonerate him any day now. Others think Whitaker accidentally gave something away. But whether it’s true or not, Whitaker can’t publicly say something like that without being seen as improperly meddling in the investigation. That brings us to the fact that Whitaker is scheduled to publicly testify before the Democratic-controlled House Judiciary Committee on February 8th. It’s a guarantee that during these hearings, Whitaker will be drilled over the claims he made about Mueller yesterday. If Whitaker was sweating buckets the last time he was in front of the cameras, just wait until the white hot pressure of testifying publicly under oath before Congress. Matthew Whitaker can refuse to show up for his scheduled House testimony, in the hope of avoiding questions about the whole thing. But in such case he’ll merely be subpoenaed, and if he still refuses to show up, he’ll be arrested for contempt of Congress. Whitaker is in a no-win situation, and he just made it even worse yesterday. This is before getting to the part about him being under criminal investigation for his toilet scam company.